ALBUM REVIEW: Lines West, "Stop, Look & Listen"
This seems to be my week – another band with that roots-rock/American sound that I love. Lines West are a fairly new collective, hailing from Bridgeport, Connecticut – and this debut full-length, Stop, Look & Listen made me do just that. 11 tracks of pure Americana-style – say what you want; there is nothing that gets me more than quality structures in songs built around acoustic guitars. Starting with the chiming “Down To Me”, the melody is sharp; the vocals work perfectly and the song is spot on in total – love the harmonies. I’m guessing the lead vocals are handled by co-writer John Radzin (who also co-founded the band with guitarist/keyboardist Brian Larney) and those vocals tie the entire track together perfectly. “Blistering Heart” is awash with drama and a taut vibe – Beatles-que in its arrangement (!) – and a clever use of minimal chord progressions yet incorporating dynamic build up and great background vocals (these guys know how to write a song); “Easy/Hard” rollicks along with a driving riff and nice use of echo on the vocals – instantly classic. “Bringing Heaven Down” is a neat, tight ditty (reins are held – guitar is cleverly muted, so to speak) with a great duet-ting vocal after the first verse and a classic-style piano solo and explodes towards the end. I say here that I don’t need to dissect the other songs on this fine album; I’ll keep it short and say these 11 tracks absolutely are winners; another of my 2014 favorites. 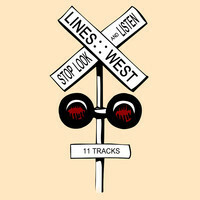 Lines West have a new fan – this album is out NOW – GO GET IT.